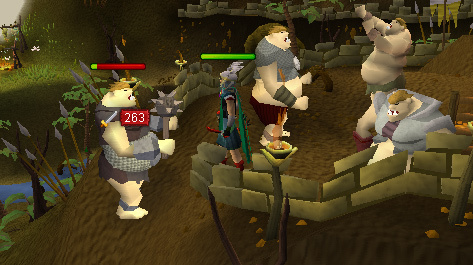 The Yanille Watchtower Wizards have noticed more Ogres roaming the area recently, and they need your assistance recovering their lost power crystals to fend off the Ogres from attacking. Can you help the Wizards before it's too late? 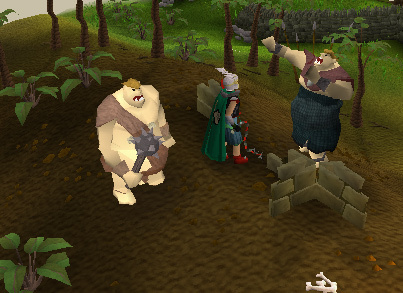 The wizards of the Yanille Watchtower have been reporting increased ogre sightings recently. Use a wide variety of your skills to help the wizards recover their stolen power crystals and stop the advance of the ogre hordes! 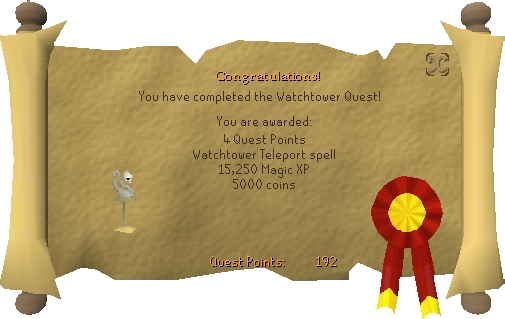 Begin by speaking to the Watch Tower Wizard in the Yanille Watch Tower. To begin, make your way to Yanille. 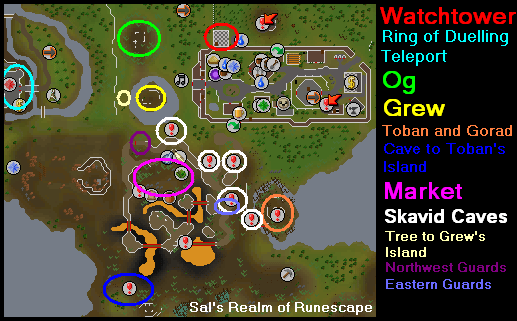 The quickest way is to use a Ring of Duelling to teleport to Castle Wars, considering you can not teleport straight to Yanille if you have not finished this quest yet. Once in Yanille, make your way to the outer side of the city's northern wall. Follow that wall west to arrive at the watchtower. You have to make your way up to the third floor. You can't climb the stairs the normal way or the guards will not allow you in. However, on the north side of the tower you should find a trellis you can climb up. Do so and you will be on the second floor of the tower. Climb up the stairs to get to the third floor. Talk to the Watchtower Wizard. Ask him what the matter is. It seems the watchtower is not working, and the tower protected the city from ogres. He will request your assistance in finding the 4 crystals that powered the watchtower, in order to keep Yanille away from harm. Accept to help him and he will send you off to look for clues in the surrounding area. Climb down to the first floor and grab the lit candle on the center table, as you will need it as you progress further into the quest. Now search all the bushes around the watchtower until you find some fingernails, a damaged dagger, a tattered eyepatch, an old robe, and some unusual armor. Once you have found all those items you can head back to the wizard. You can climb the tower using the stairs this time. After you made it back up, show him the items. By seeing the fingernails, he will be able to determine that the crystals were taken by a servant to the ogres, known as Skavid. 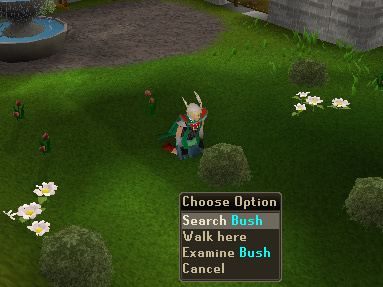 Once you finish conversation with him, you may drop the items you found in the bushes, they are not needed anymore. Make sure you have 2 ropes, a weapon, and maybe some food. You must now find a way to Gu'tanoth. Talking to the nearby ogre tribes is your best bet. 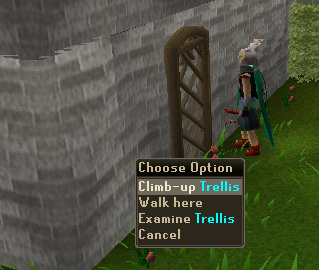 Go back inside Yanille walls and exit them again using the western entrance. From there, travel northwest towards a settlement with several ogres. One of the ogres there is named Og. Speak with him about entrance to the city of ogres. Og will want you to get a gold bar from a chieftain ogre named Toban who can be found to the southeast. He will also give you a key to Toban's chest. Run just south of Og and there will be an island surrounded by a small amount of water. To the west of the island you will find a long branched tree on your side of the water. Use a rope on the branch and you will swing across, but lose the rope. Talk to Grew, one of the ogres on the island and tell him you are an adventurer. He wants you to fight his enemy, Gorad, and show him one of Gorad's teeth as proof you beat him. Before you leave the island, pick up one of the several Jangerberries scattered around the area. To leave, use the ropeswing to the north. Before you continue, make sure you have a set of dragon bones and the equipment necessary to defeat a level 68 ogre, including food if you think you will need it. Now head southeast toward Toban's island. 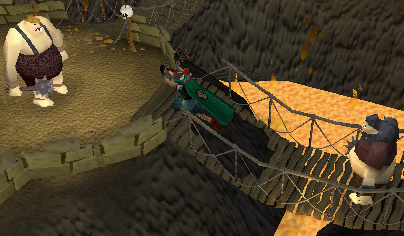 You will not be able to get across the bridge because it is broken. Instead, you will have to continue travelling southwest until you reach a cave (use the map at the beginning of the guide for help). Enter the cave and you will find yourself on Toban's island. Talk to Toban about entrance to the city of ogres. He will think you are puny and not worthy so he wants you to prove yourself by bringing him a set of dragon bones. Talk to him again if you have the bones and he will give you a part of a statue (relic part 3). Gorad should be nearby. If you are ready you may attack him at any time. He should be easy to kill. When he dies, his tooth will be placed in your inventory. Finally, use the key Og gave you on the chest near Toban and you will get Toban's gold. Leave the island from the same spot you came in and run back to Grew on his island. You will have to use your second rope to get on the island again. Once you are, give Grew the tooth and he will give you another part of the statue and 1 of the 4 crystals (if you gave Og Toban's bar first, then he will give you the crystal). Now talk to Og and give him Toban's bar in exchange for another part of the statue. 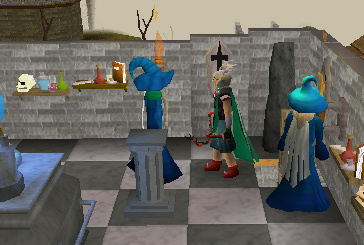 Now that you have all 3 pieces of the statue, return to the wizard and he assemble them to make the ogre relic, which will grant you access to Gu'tanoth. Make sure you have the ogre relic, 20 coins, a death rune, the lit candle, a gold bar, and maybe some food. Then go back to the area west of Yanille, and south to Gu'tanoth. Talk to the northwest guard (refer to the map at the beginning of the guide for help) who will want a sign of friendship. Give him the ogre relic and he will let you in. Walk down to the market and go to the stall with rock cakes (symbolized by a food shop on the map). 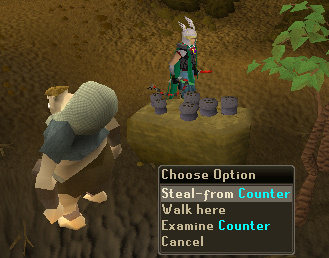 You have to steal one, but make sure to do it while the ogre is not looking or you will be attacked (if you are caught, however, you can ignore the chat box by not clicking "click here to continue" and you will not be attacked). Do NOT eat the rock cake, it will just cause you to lose health. Exit the market the way you came and head south along the path. There will be two ogre guards blocking access over the bridge. Try climbing over the battlement and the guards will stop you. Talk to them and then use the rock cake on one of them. Now climb over the battlement and walk across the bridge. Follow the path some more until you find another bridge, that is broken. You can jump over it, but you have to pay the guard 20 coins first. Run across another bridge and talk to a city guard. Tell him you seek passage into the skavid caves. He will tell you a riddle. The answer to it is 'death rune'. So use your death rune on the guard in exchange for a skavid map. Exit Gu'tanoth the way you came in. Make sure you have the lit candle you got from the watchtower and enter any skavid cave (refer to map at the beginning of the guide). 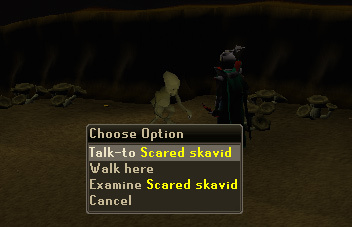 If the Skavid in the cave you entered isn't a "Scared Skavid", exit the cave and try one of the other ones. Keep doing that until you find the Scared Skavid. Talk to it, without threatening it. It will teach you their language. Now exit the cave and go talk to all the other Skavids in the other caves. When talking to the other Skavids, you have unlimited tries to reply the correct way. Keep choosing options until the Skavid replies in a way of understanding, and not just "???". As you are going through the caves and talking to each Skavid, you should stumble upon a few cave nightshades. Take some, but do not eat them. Once you have correctly replied to all the Skavids, return to the Scared Skavid. The Scared Skavid will tell you to speak to the mad ones in their cave. Walk up the path toward Gu'tanoth and talk to the eastern guards (refer to map at the beginning of the guide for help). Give them your gold bar and they will allow you to pass. Follow the path across the bridge and enter the cave. Talk to the Mad Skavid there and correctly reply to whatever he says. If you fail, keep trying. You can use your quest journal for answers. When you get it right, it will be impressed and give you the 2nd of the 4 crystals. Before you leave, take some cave nightshades if you have not already. Make sure you have a cave nightshade an anti-dragon shield or antifire potion. Head to the ogre market. There is a cave there being guarded by two Enclave Guards. Use a cave nightshade on one of them and a warning message will appear. Continue on into the cave. Up ahead are many non-aggressive Ogre Shamans, do not attack any. There are also Greater Demons, Blue Dragons, and other monsters. So make sure your anti-dragon shield is equipped or take a sip of your antifire potion. You may also want to put on protect from melee. All you have to do now is run straight north and exit the cave. 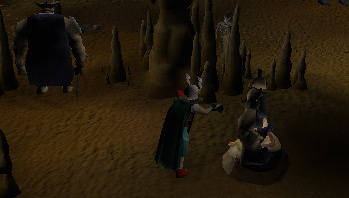 You should come out just south of Yanille. If you do not have a clean guam, a vial of water, a set of jangerberries, a pestle and mortar, or a set of bat bones, stop and get them from a bank or their spawn before moving on. If you have all the items just mentioned, head back and talk to the wizard. Use a clean guam on a vial of water. Use the jangerberries on the guam potion (unf). Be careful not to eat the berries! Use the pestle and mortar on the bat bones. Use the ground bat bones on the mixture. Have the wizard do the final step and enchant the potion for you. Once you have the magic ogre potion, grab a pickaxe, some food, and your anti-dragon shield or antifire potion. Then travel to Gu'tanoth for hopefully the last time during this quest. Also, if you don't have another cave nightshade you need to get one. When you are ready, go to the ogre market again. Use a cave nightshade on one of the two guards and you will be in the cave. Now find an Ogre Shaman and use the potion on him. The potion will kill the Shaman. Repeat that with the other 5 other Shaman's in the cave. The sixth one will give you the third crystal. Now run to the middle of the cave and mine the Rock of Dalgroth for the fourth and final crystal. [^] Talk to the Watchtower Wizard on the third floor of the Watchtower. [^] Search the tower's surrounding area for clues. 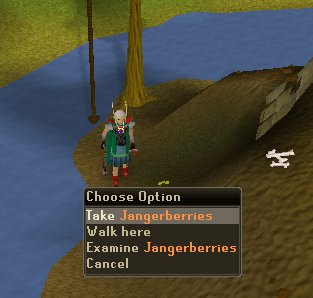 [^] Talk to Grew and pick up some jangerberries. [^] Talk to Toban, kill Gorad, and take Toban's gold. [^] Talk to Grew and Og and give them what they requested, then take the 3 relic parts to the wizard. [^] Give the northwest guards of Gu'tanoth the ogre relic. [^] Steal a rock cake. [^] Pass 2 bridges by giving the guards what they want. [^] Earn skavid map from city guard and find the Scared Skavid. 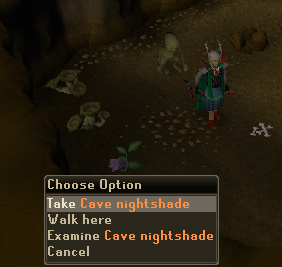 [^] Correctly reply to all the normal Skavids and pick up two cave nightshades. [^] Talk to the Scared Skavid again. [^] Give the eastern guards of Gu'tanoth a gold bar. [^] Correctly reply to the Mad Skavid for the second crystal. [^] Gain access to the enclave and successfully make it out the other side. [^] Make the magic ogre potion. [^] Go back to the enclave and kill 6 Shamans for the third crystal. 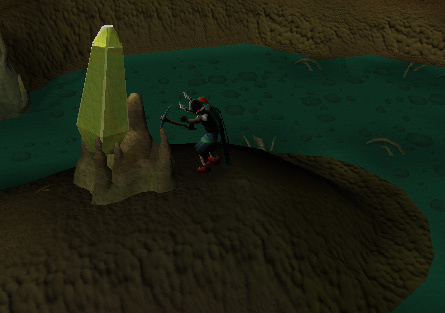 [^] Mine the Rock of Dalgroth for the fourth crystal. [^] Return to the wizard, place the crystals on the pillars, and pull the lever.